A 'full-size' compact keyboard? Yes, odd as it sounds, this is the first compact keyboard which features full-size keycaps and standard 19.05 mm key pitch (the space between the keys) identical to what you would find on any conventional keyboard. 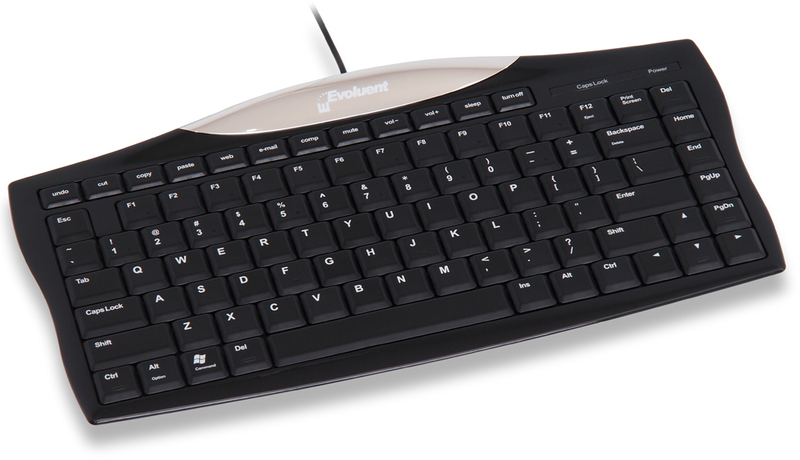 The Evoluent Essentials Keyboard is, essentially a conventional keyboard with the numeric keypad removed and the navigation keys populating a single column on the right side of the keyboard. It features a ultra-thin neutral profile and uses high quality crisp low-travel scissor-switch membrane keyswitches. Tactile raised bumps (both dots and ridges) on a variety of keycaps beyond the traditional 'F' and 'J' provide significant tactile feedback to the fingertips improving positional feedback and keying accuracy. The Evoluent Essentials keyboard also includes 12 hot keys (including Cut, Copy, Paste and multimedia functions) and is plug and play. NOTE: This compact keyboard does not have an embedded number pad, Scroll Lock Key, or Pause/Break Key. Regular size keyboards with integrated numeric keypads on the right make reaching for your mouse on the right-hand side an ergonomic risk factor. 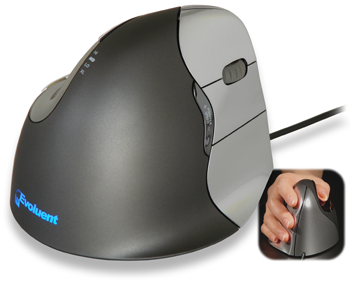 The further you have to reach for the mouse (from the dominant hand home row, over the navigation keys, over the numeric keypad), the greater the risk of injuries to the arm and shoulder due to overreaching. The Evoluent Essentails Compact Keyboard eliminates this potential risk factor by eliminating the built-in numeric keypad. Standard sized keycaps and key pitch (the space between the keys) results in no learning curve when transferring keyboarding skills to this keyboard. On most compact keyboards, the function (F1-F12), cursor/arrow (↑↓←→) and modifier keys (ALT/CTRL/SHIFT) are usually smaller than normal resulting in keying errors and frustration. This is not the case on this keyboard where all 84 standard keys preserve all touch typing skills previously acquired. n feature including Cut, Copy, Paste, Undo, Web, E-mail, Computer, Mute, Volume Down, Volume Up, Sleep, and Turn Off. Positional feedback is provided on this keyboard on more than just the traditional 'F' and 'J' keys. A combination of raised 'dots' and raised 'ridges' on a variety of keys provide significant relief surface feedback to the fingertips which aid touch typists and reduce the frequency of looking down to correctly target specific keys. Here is a complete list of the the tactile indicators. The extremely low profile (key tops are only 0.4" or 1 cm off the top of the desk) eliminate the possibility of wrist extension (i.e. bending 'up' at the wrist) when using this keyboard. 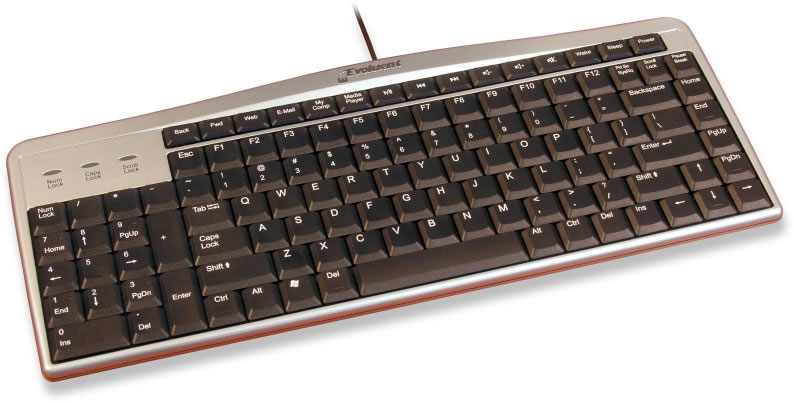 The neutral profile ensures that all keys are at the same height, unlike most keyboards which have a positive profile resulting in the function row being significantly higher than the bottom row on the keyboard (even with the legs at the back not deployed). .
As all keys are standard size and spacing users will not experience the sensation that the keyboard is 'narrower' as can be the case with compact keyboards which utilize narrower keys or reduced size keycaps. Since most computer users use their numeric keypads only occasionally the absence of a numeric keypad (attached or embedded) usually is not an issue. Most users will quickly adapt to accessing the upper rank numerics for those occasional time when they are needed. As an option users can also purchase an independent numeric keypad which can be accessed as needed and stored out of the way when not in use. Full Size Keycaps and Tactile Raised Bumps - No learning curve when switching to this keyboard, one of the first truly compact keyboards (but not a 'mini' keyboard) on the market. High Quality Scissor-Switch Membrane Keys - Precision scissor-switch membrane keyswitches provide crisp keying action and fast snap-back of the keys after actuation, unlike some compact keyboards which use non-stabilized wobbly membrane keys which lack crispness and feel mushy. No Function Key Required - All keyboard actions are directly accessible with a single key, no 'Fn' key embedded layer multi-key actions are required.